There was an article in the WSJ recently, that resonated with me. While we don’t work in several of the fields that were mentioned as ‘hot’ for the +50 crowd, I would agree that professional services and executive recruiting are often done best by experienced workers. 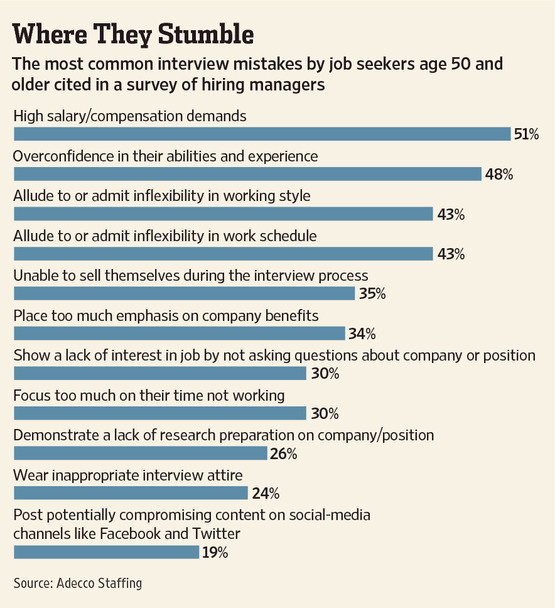 But what really resonated with me is the ‘where they stumble’ chart. Refreshingly, I met a candidate who was well into his 50s a few weeks ago who was a)super contemporary (not just taking some lame class to keep up, he’s been embracing new technology and business models all along), was b) super flexible (sure, love to live in a new city!) and c) upbeat (ugh, don’t bore me with all the negativity about the past, fill it in, boss, job, co-workers). Assuming people are experienced, too often they blow it on image & attitude. It all counts.